To Cite: Fazeli M, Zarei N, Moazen B, Nejatollahi F. Anti-Proliferative Effects of Human Anti-FZD7 Single Chain Antibodies on Colorectal Cancer Cells, Shiraz E-Med J. 2017 ; 18(3):e59936. doi: 10.5812/semj.45219. Background: Colorectal cancer (CRC) accounts for the third most common cancer-related death in human. Wnt growth factors signaling have an important role in the CRCs’ development. Frizzled family receptor 7 (FZD7) belongs to the 10-member Frizzled (FZD) family of receptors and has an important role in triggering Wnt signaling. Antibody-therapy is an important class of modern medicine. Human single chain antibodies, which are composed of VH-Linker-VL are small antigen-binding units with unique properties, which overcome monoclonal antibodies and are applied for certain cancer immunotargeting approaches. Objectives: This study aimed at determining the anti-tumor properties of 2 anti-FZD7 scFvs phage antibodies. Methods: Two specific anti-FZD7 scFv antibodies were assessed for their anti-cancer effects. Flow cytometry was used to investigate the binding ability of scFvs to SW-480 colorectal cancer cell line, and SKBR3 cells, as the negative FZD7 cell line. Cell proliferation assay was performed to evaluate the growth inhibition effects of the different concentrations of anti-FZD7scFv phage antibodies (1000 to 4000 phage/cell). Mann-Whitney U test was used to compare percentages of cell growth between treated and untreated cells. Results: Fluorescent activated cell sorting (FACS) analysis revealed that scFv I and II bound to 62.4% and 63.7% of SW-480 cells, respectively, whereas 6.4% and 8.3% bound to SKBR-3 cells, as the negative control. Results of MTT assays on SW-480 demonstrated growth inhibition of 53%, 63%, and 83% for scFv I (3000 phage/cell) after 24, 48, and 72 hours, respectively, while scFv II (4000 phage/cell) treatment showed growth inhibition of 33%, 47%, and 63% for the same period of time, respectively. No significant inhibitory effect for scFvs on the cell growth of SKBR-3 cells was observed (P < 0.05). Conclusions: Targeted therapy using antibodies has been considered as a new cancer immunotherapy in the recent years. In this study we applied 2 anti-FZD7 antibodies to assess their effect on colorectal cancer cells. Results demonstrated that both scFvs bound to the SW-480 colorectal cancer cell expressing FZD7 receptor. Significant cell growth inhibition for both anti-Fdz7 scFvs after 72 hours of incubation with the optimum amounts of the antibodies was detected. The stronger potential of scFv I for inhibiting the growth of cancer cells was also obtained. The use of scFvs against colorectal cancer cells offers a therapeutic potential for these antibodies in colorectal cancer immunotherapy. Colorectal cancer (CRC) is one of the most frequently diagnosed cancers among humans, which accounts for the third cause of cancer-related deaths (1). Several studies have shown that mutations of Adenomatouspolyposis Coli (APC) or β-catenin (CTNNB1) genes, downstream factors in the canonical Wnt signalling pathway, are the main causes of sporadic colorectal cancers (2, 3). However, suppressing Wnt signaling by blocking upstream ligands and receptors of this pathway has been effective in the growth and survival of colon cancer cells (4-6). In Wnt signaling, interaction of frizzled receptor with 1 of the 19 Wnt isoforms results in animal cells’ differentiation, polarity determination and cell proliferation modulation. Frizzled family receptor 7 (FZD7) belongs to the 10-member Frizzled (FZD) family of receptors (7). They all contain an N-terminal, which acts as a signal peptide, an extracellular cysteine-rich domain (CRD) that binds to Wnt ligands, an intracellular C-terminal PDZ domain, to interact with disheveled (Dvl) and a 7-pass transmembrane domain (7, 8). Although FZD7 expression is limited in normal tissues (9, 10), recent studies suggest that it is predominantly expressed in several cancer cells, including colon cancer (9, 11, 12). Currently, scFvs (single-chain fragment variable) are widely used for diagnostic and therapeutic applications, and include 35% of antibodies, which are applied in clinical trials (13, 14). Single chain antibodies, which are composed of VH-Linker-VL, are small antigen binding units with unique properties, including human origin, not eliciting HAMA reaction (human anti-mouse antibody response), high specificity, affinity properties, deep penetration in solid tissues, easy manipulation, and economic cost production in prokaryotes (15-19). Recent studies have shown the important role of these antibodies in cancer immunotherapy (20-24). This study aimed at evaluating the anti-proliferative effects of 2 human-specific anti-FZD7 scFvs, available at our laboratory (article in process), on SW-480 colorectal cancer cell line. Human colorectal cancer cell line SW-480, an FZD7 expressing cell line, and also SKBR-3 cell line, a breast cancer cell line, as FZD-negative cells, were obtained from the national cell bank of Iran, Pasteur institute of Iran (Tehran, Iran). The cell lines were cultured in RPMI-1640 medium containing 10% fetal bovine serum, 100 U mL-1 streptomycin and 100 mg mL-1 penicillin at 37°C, in a CO2 incubator. 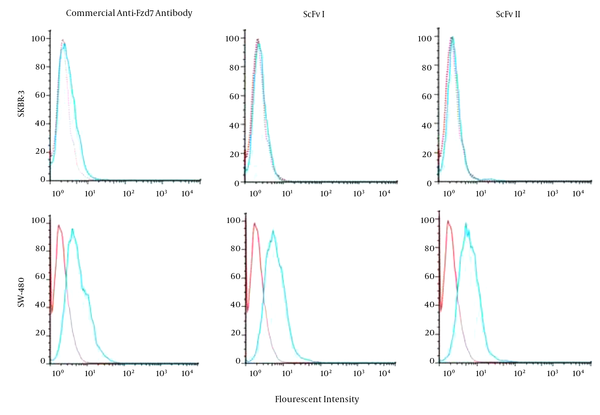 To evaluate the cell surface binding ability of the selected scFvs in comparison with a commercial anti-FZD7 antibody (Abcam, UK), flow cytometry analysis was used. Briefly, 200 µL of either of the selected-scFv antibodies (1011pfu/mL) or commercial rabbit-anti-FZD7 polyclonal antibody were added to 2 × 105 cancer cells and incubated at 4°C for 1 hour. Cells were treated with M13KO7 helper phage and used as an isotype control. After washing with ice-cold Phosphate Buffered Saline (PBS), and addition of rabbit anti-fd antibody (Sigma-Aldrich, Germany), they were incubated at room temperature for 30 minutes, followed by 30 minutes of incubation with PE-conjugated anti-rabbit antibody. After washing, the amount of bound phage was measured by a FACS Calibur (BD Biosciences, USA). Mann-Whitney U test was used for comparing the means of percentages of cell growth between antibody-treated and untreated cells. Data are shown as the mean ± standard deviation. P values of less than 0.05 were considered significant. Flow cytometry assay revealed the binding of both selected anti-FZD7 phage-antibodies and anti-FZD7-commercial Ab on colorectal cancer cell line, SW-480. The SKBR-3 cell line was used as the negative control. There was no significant shift in fluorescent intensity of SKBR-3 cells treated with anti-FZD7-scFv or commercial antibody. The scFv I and II bound to 62.4% and 63.7% of SW-480 cells and 6.4% and 8.3% of SKBR-3 cells, respectively. The fluorescence intensities obtained from M13KO7-treated cells, as isotype control, was 21% (Figure 1). The cell lines were treated with either anti-Fzd7-commercial Ab or anti-Fzd7- scFvs. The fluorescent intensity detected for 2 scFvs and commercial Ab bound to the SW-480 cells showed a shift compared to the intensity of the isotype, cells treated with M13KO7 helper phage, while the fluorescent intensities of the scFvs and commercial Ab overlapped the isotype intensity when SKBR3 cells were treated. Different concentrations of anti-FZD7 scFvs were applied on SW-480 and SKBR-3 cell lines and the anti-proliferative effects are presented in Figures 2 and 3. After 24, 48 and 72 hours of treatment of cells with each phage antibody, the percentages of cell growth inhibition were detected. The scFv I and scFv II significantly inhibited the growth of the SW-480 cancer cells in comparison with the untreated cells and SKBR-3 cell line as the control (P < 0.05). Treatment with scFv I (3000 phage/cell) resulted in 53%, 63%, and 83% growth inhibition of SW-480, after 24, 48, and 72 hours, respectively. 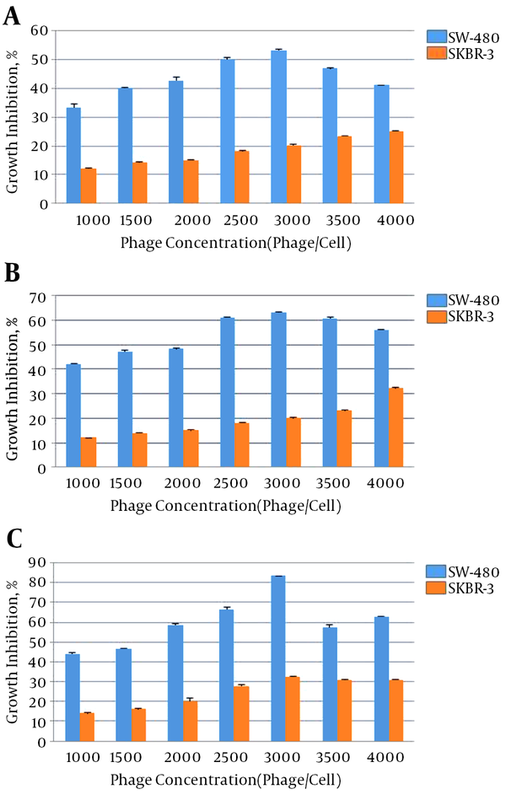 The scFv II (4000 phage/cell) treatment resulted in 33%, 47% and, 63% growth inhibition of SW-480, respectively. No significant inhibitory effect of scFvs on the cell growth of SKBR-3 cells was observed (P < 0.05). The percentages of growth inhibition of SKBR-3 cells after 24, 48, and 72 hours of treatment with scFv I (3000 phage/cell) were 20%, 20%, and 32%, and that of scFv II (4000 phage/cell) was 11%, 22%, and 27%, respectively. Recent studies have suggested that canonical Wnt signaling pathway is over-activated through FZD7 receptor in many cancers including colorectal, hepatocellular carcinoma (HCC), triple negative breast cancer (TNBC), esophageal cancer, gastric cancer, and Wilm’s tumor cell (25-30). Suppressing Wnt signaling either through Wnt ligand blocking or FZD7 receptor knockdown or soluble peptide fragments to antagonize FZD7 has always been advantageous as a potential strategy to treat FZD7-dependent cancers (31). However, several obstacles including adverse immune responses of whole antibody therapy have to be considered when using this technology for cancer treatment (32). Targeting specific receptors, which are overexpressed in tumor cells is a safe method of combating cancer (33). One effective method is antagonizing the receptor through soluble peptide fragments. Antibody-therapy is an important class of modern medicine. However, the disadvantages of monoclonal antibodies, including low tissue penetration, production costs, and some side effects (34, 35), have led to the development of new effective approaches to improve these drawbacks. One effective approach to block Wnt signaling is developing agents to inhibit receptor-ligand interaction. Among different agents, human scFvs has been shown to have high anti-tumor growth activities, which suggest the advantages of these antibodies as proper tools in targeted therapies (36). The small size of selected scFvs, their human origin, tissue penetration, and ability to be manipulated by genetic engineering are some of the important advantages of these agents. To evaluate the effects of anti-FZD7 antibodies, their binding to the cancer cell line was investigated. Flow cytometric analysis indicated that the anti-FZD7-scFv I and II antibodies bound to 62.4% and 63.7% of SW-480 cancer cells while their bindings to SKBR-3 was 6.4% and 8.3%, respectively. The obtained results are consistent with the FZD7 expression level of these cell lines. According to previous studies, FZD7 receptor is overexpressed in SW-480 cell line while its expression in SKBR-3 is low (9, 37). Vincan et al. (12) reported on the abundant expression of FZD7 in SW-480 colorectal cancer cells, which activates Wnt/FZD signaling pathway and leads to cellular processes such as cell differentiation, adhesion, and motility. These processes are central to epithelial-mesenchymal transition (EMT) and Mesenchymal-epithelial transition (MET), therefore, tumor growth and progression occurs. The lack of FZD7 on SKBR-3 breast cancer cells and its presence on triple negative breast cancer (TNBC) cells demonstrated by Yang et al. (37), indicated the important role of this receptor in the proliferation of TNBC cells and immunotherapy against FZD7 as an important treatment strategy in triple negative breast cancer. Over-expression of FZD7 in colorectal cancer implies that this receptor may be involved in the carcinogenesis of this cancer and might be critical for the growth of these cells (7). Studies have demonstrated that FZD7 has a vital role in preserving self-renewal capacity of embryonic stem cells and it can be used as a novel embryonic stem cell-specific surface antigen (38). This study evaluated the anti-proliferative potential of anti-FZD7 scFv antibodies. Cell treatment with anti-FZD7 phage-antibodies decreased the growth of SW-480 cancer cells. The optimum concentration for scFv I was 3000 phages/cell, and that of scFvII was 4000 phages/cell. Following 72 hours of incubation of SW-480 cancer cells with the optimum concentrations of scFv I and scFv II, considerable cell growth inhibition of 83% and 63% was observed. Regarding the effect of scFvI, due to very high concentration of phage antibody above 3000 phages/cell, an adverse effect was observed. No significant effect on cell growth of SKBR-3 negative cell line was observed for either of these scFv-antibodies. Similarly, knockdown of FZD7 expression by siRNA has resulted in the reduction of colon cancer metastasis (9, 39). It has also been reported that inhibition of FZD7 using a dominant negative extracellular domain blocks the growth of human colon cancer cells in vitro and in xenograft animal models (11). Moreover, FZD7 shRNA gave rise to a significant suppression of Wnt/β-catenin signaling and subsequent cell proliferation and tumor growth in vivo using TNBC cells (37). The results of this study showed that both scFv-antibodies were able to exert anti-proliferative effects on SW-480 colorectal cancer cells. However, comparing these 2 scFvs indicates the stronger potential of scFv I on inhibiting the growth of cancer cells. These effects are mainly via the activation of the canonical Wnt signaling pathway. According to Pode-Shakked et al. (30), inhibition of FZD7 using a blocking antibody leads to a reduction in clonality of cancer cells and induces apoptosis in cells expressing FZD7. Identification of a proper antigen for targeted therapy is a key concept (40). The extracellular part or CRD domain of FZD receptors, which act as binding sites for Wnt ligands, can be targeted by peptides to inhibit binding of wnt ligands thus preventing Wnt/β-catenin signaling. It has been shown that targeting of special parts of some extracellular domains of cancer cell receptors leads to anti-proliferative effects (36, 40-42). The specificity of tumor binding and anti-proliferative properties of the selected scFvs suggests that these human high affinity and small anti-FZD7 scFvs might have a therapeutic potential for colorectal cancer targeting therapy. The results of this study are in accordance with other recent findings suggesting that inhibiting Wnt signaling through blocking of FZD7 will suppress Wnt signal-mediated cell proliferation in cancer cells. Further studies are needed to show the in vivo effects of these antibodies. This study was financially supported by Shiraz University of Medical Sciences and Shiraz University. The present article was extracted from the thesis written by Neda Zarei (grant number 9667). Conflict of Interest: The authors declare that there were no conflicts of interest.